At last we made it! Right into the iconic Wall Street Journal! Or maybe this is fame - being featured in a sailing display in the sailing museum at Mystic Seaport in Mystic, Connecticut, www.mysticseaport.com . Here one of our T12 Racing Sloops (minus the keel) is mounted on a frictionless track to demonstrate how a boat sails upwind and downwind. This photo was sent by Jim and Pat Trexler with the help of Chad and Susie. Chad grew up with a T15 Racing Sloop. Jim and Chad and Susie built a T37 Racing Sloop which they sail in Lake Tahoe. Susie and Chad seem to be thriving at college (Susie at Lewis and Clark, in Portland, and Chad at Whitman, in Walla Walla). Susie just sent us this note and photo (see below), so we could send it on to you. The photo was taken at Mystic Seaport last November. I'm sure you can see how the exhibit worked -- there was a fan to provide the wind, and you could rotate the T-boat and its mount.? If you set the sails correctly for the orientation relative to the wind, it would sail forward along the track. Chad was happy to show the young audience how to do it! From Phone Books and sailing museums to sailing magazines! 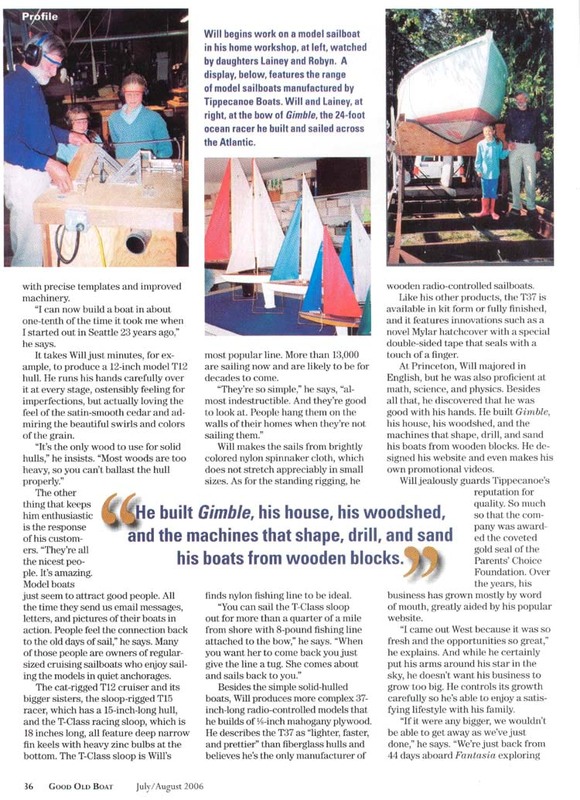 We especially enjoyed this article which appeared in the nationally distributed sailing magazine, "Good Old Boat", www.goodoldboat.com . These pages are supposed to be pictures that owners have sent to us but this page seems to be more about the story of Tippecanoe Boats and some of the honors and publicity we have received. While we are at it, I'll just show a few more things we are proud of, although, truly, none of these honors mean as much to us as the pictures that owners send to us of their boats! Review: Our testers, an experienced sailor and three youngsters, lavished high praise on this racing sloop. More than a toy, it performed superbly under all conditions from the slightest whisper of a breeze in a swimming pool to a stiff wind in a lake. It cannot capsize because more than half its weight is in its cast zinc ballast. Noteworthy are the quality of the boat materials and instructions for assembly (requiring some adult help for preteens) and sailing. A winner in every way, was their consensus. Thank you for your order! We are very complimented that you chose one of our yachts as a gift to Shania Twain. It is also the first boat that we have ever addressed to a Chateau. Everyone here thought it was great. If Ms. Twain or her husband have any questions at any point, or need another yacht to race with the first one, I hope they will feel free to call us. Our larger yachts are very distinctive gifts, whether they are used for display or for sailing. I hope you will keep us in mind when other occasions arise where a very fine gift is appropriate. At times we do have these larger yachts available for immediate shipment. All of our boats sail beautifully. With Central Park and the classic sailing pond almost at your doorstep and Spring breezes beckoning, I'm certain you would enjoy one of our T-Class Racing Sloops yourself. They are a fun way to relax. There are more than 14,000 TClass Yachts sailing. I have included our brochure on all our different sizes of boats. The larger pictures (8 ½ x 11) are pictures of the T32, very similar to the boat we sent to Shania Twain. 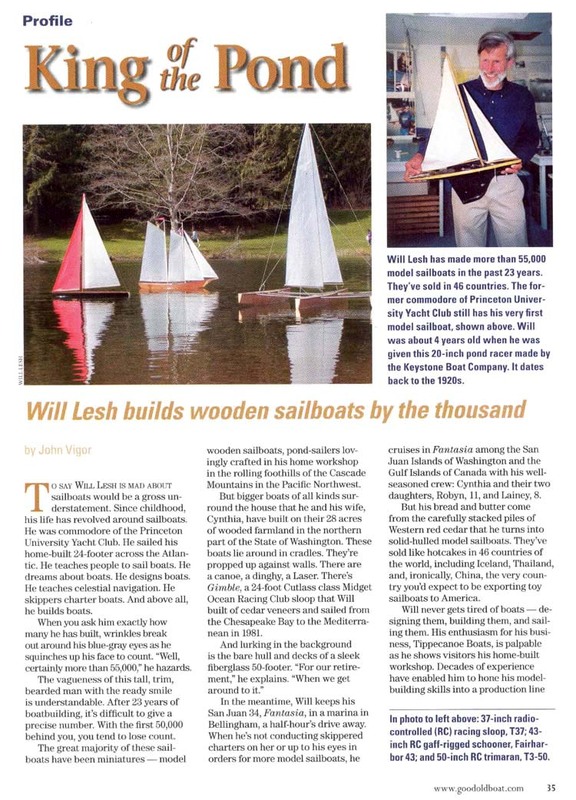 SEATTLE -- For Will Lesh it has always been about sailing. months old and still has his first wooden sailboat. the Caribbean and across the Atlantic. where he does his part to get future generations hooked. Class Racing Sloop sells for $56. and sailing experiences into his model sailboat designs. school for a year at Georgetown University. But in between, the sailing bug bit hard and often. ending up shipwrecked on a desert island in the Caribbean. music, Lesh was ready to settle down. spinnaker cloth sails in the garage of their rented home. lots of space and proximity to the mountains and the water helped. his sales is through the Internet. "The Internet works especially well for a company of our size," he said. about our family, our business and our product." And coming soon, an article written by Will published in the AMYA "Model Yachting Magazine" Spring 2008 issue on building the T50 MOD hull.